baby drawing of Santa Claus paints. shining lights Christmas garland. Amazing young model looking playfully at camera while posing in cozy red sweater on sofa and holding lights of Christmas garland. Wonderful pretty woman with curls smiling cheerfully at camera posing with blue lights of garland glowing in dark. 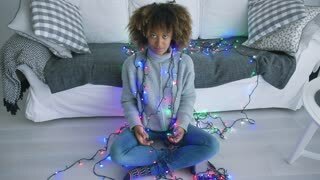 Content young ethnic woman in white sweater posing at home with long tangled garland glowing with different lights. 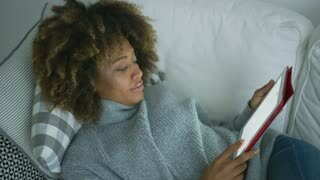 Wonderful young model in cozy sweater lying on sofa in morning time and watching tablet while relaxing alone. Young ethnic model in red sweater sitting on couch at home all in twisted glowing garland looking despair to untagle it. 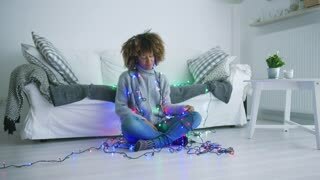 Young beautiful ethnic model in red cozy sweater sitting on sofa at home and posing in tangled glowing lights of garland. Portrait of adorable young woman posing at home in sweater holding plenty of glowing lights of garland smiling at camera.